Leading Manufacturer of welding fume extractor from Coimbatore. Welding Fume Extractor with suction arm to collect dust particles and fumes from welding process. 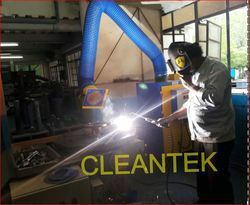 CLEANTEK Welding Fume Extractor are manufactured as per the accepted quality standards. Extraction done by using suction arm assures good health and safety of human resources by removing welding smoke. Additionally, Welding Fume Extractor keeps product and production machines contaminant free. We give the time delivery of Welding Fume Extractor at given time frame. IN welding fume extractor Contaminated air is drawn by the suction motor threw the washable stainless steel mesh filter which trap the large dust particles. Then the air pass through fine filter fabric, here fine dust particles are filtered. Remaining air stream pass into the strong electric field (12.5 Kv to 13 Kv) (Ionizing section) where particulate receives an electrical charge. The charged particles then pass into a collector plate section made up of a series of equally spaced parallel plates. Each alternate plate is charged with the same polarity (6 Kv -7Kv) (Collecting section) as the particles, which repel, while attract and collect the contaminants. The contaminants are held in these plates until they are washed away. Further air pass into the gas phase activated carbon filter. Here the toxic gases are absorbed by the activated carbon. Then pure air sent out threw Exhaust line to atmosphere.